February 1958, Prince Rupert. As brief reminder in case you have just joined the blog, as a young man living in Prince Rupert (1957-1959) I had written a number of letters to the various locomotive manufacturers, requesting information and photographs of their products. So far I’d received some great materials from Fairbanks-Morse, Baldwin-Lima-Hamilton, and The Budd Company of Philadelphia. 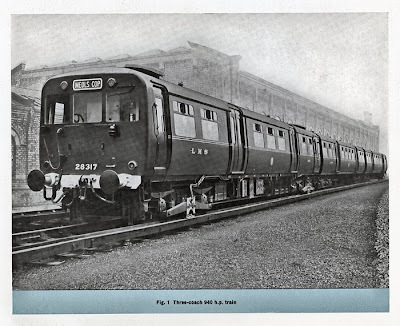 About the only place I could see photos of English locomotives was the occasional shot in either Train & Travel, or Railroad magazine. 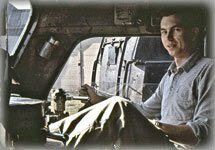 Our newfound family friend in Prince Rupert – Mike – served his apprenticeship at English Electric during his mechanical engineering studies. I guess the thing that always struck me most about the differences between American and British locomotives, was their apparent size. 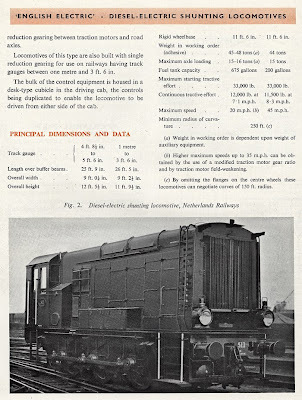 While American locomotives have a beefy muscular look about them, the British locomotives had a diminutive size, with odd-looking buffers and windshields! Of course the smaller size was attributable to the restricted clearances of much of British rail structures and tunnels. Check out this website for a visual comparison between a GM and GM Class 66 locomotives being towed to loading site. Within a few days, another large envelope arrived, addressed to R. McDonald, Esq., of Prince Rupert. The title of courtesy - Esquire - was a nice touch for a 15-year-old kid! 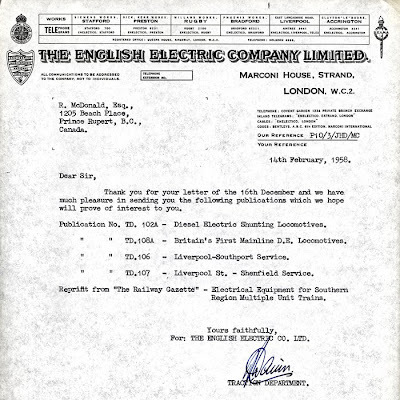 English Electric had sent along four very interesting brochures on their line of electric and diesel-electric locomotives. 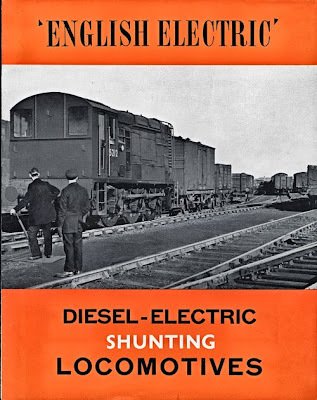 The “Diesel-Electric Shunting Locomotives”16 page brochure described the technical details of the 400 horsepower 0-6-0 Shunting Locomotives. The first English Electric 0-6-0 was built in 1933, and by the end of 1952, more than 300 locomotives of this type were in service. This unit was available in 4 ft. 8½ to 5 ft. 6 in., and 1 metre to 3 ft. 6 in., gauges on an 11 ft. 6 inch rigid wheelbase. The 400 hp diesel was rated at 1,270 tonnes on level track. 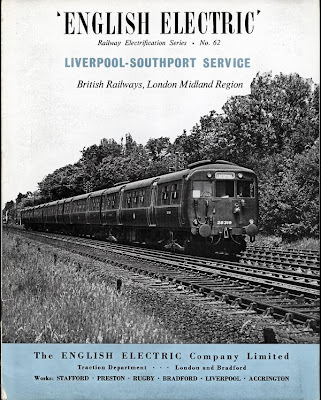 Brochure No.62 describes the electric train employed in the Liverpool – Southport Service of British Railways London-Midland Region. This train is composed of a 940 horsepower multiple unit train comprised of 59 motor coaches, 59 non-driving trailers, and 343 driving trailer-coaches. These are configured to form either three coach units (as pictured) consisting of a motor unit and two coach units, or three coach units consisting of a motor, non-driving trailer and driving trailer-coach. A five-coach unit is shown on the cover. This equipment is designed to replace the original rolling stock built between 1904 and 1910 by the Lancashire and Yorkshire Railway. 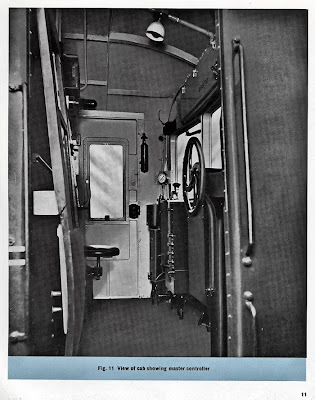 This equipment was placed in service between 1939 and 1940. A view of the cab showing the master controller. Four nose-suspended traction motors are provided on each motor coach and drive 36-inch diameter wheels through spur gearing with a 64/17 gear ratio. The four pole series wound machines have a one-hour rating of 235 hp and a continuous rating of 184 hp at 580 volts, with a maximum service speed of 60 mph.